Vietnam Prosperity Joint-Stock Commercial Bank (VPBank) has just received 4 prestigious awards by reputable international organizations, including “Best Commercial Bank Vietnam 2014”, “Straight-Through-Process”, “Best Banking Product Vietnam 2014”, and “Best Trade Finance Bank Vietnam 2014”. The “Best Commercial Bank Vietnam 2014” Award is presented by UK’s International Finance Magazine (IFM), the most prestigious magazine in the field of Banking – Finance worldwide. The evaluation process was conducted independently, based on audited reports and compulsory objective interviews with partners and customers. Also, this is the 8th consecutive year VPBank has the honor to be given the “STP (Straight-Through-Process) Award by The Bank of New York Mellon (BNYM). The STP Award is held annually to honor banks which implement high quality international payment transactions, based on Straight Through Processing, one of the important criteria for evaluating the quality of automated payment of bank. 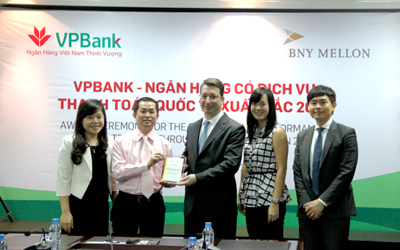 According to BNYM, VPBank achieved STP rates of around 98% in 2013. Especially, the Global Banking & Finance Review (GBAF) of UK has recently rewarded two awards at the same time to VPBank, namely “Best Banking Product Vietnam 2014” for VPLady card – a product designed specifically for women and “Best Trade Finance Bank Vietnam 2014”. Regarding the recent awards, VPBank’s CEO Nguyen Duc Vinh has shared that: “These prestigious international awards mean the recognition of reputable financial institutions, once again determining the quality of products and services, reputation as well as the prominent competitiveness of VPBank in Vietnam’s banking-financial market. In the near future, VPBank will concentrate on improving its service quality and added value as well as outstanding advantages towards an international standard bank”. So far, VPBank’s charter capital has reached over VND 7.7 trillion, with a network of more than 200 business units in 33 provinces and cities nationwide. VPBank’s total assets worth more than VND 121 trillion, thus VPBank is considered as one of the Joint-Stock Commercial Banks with largest total assets. In 2013, the profit after tax of VPBank exceeded VND 1,000 billion for the first time. For more information, please contact 1900 545 415 or 04 3928 8880.